San Casciano dei Bagni is a renowned thermal destination, located on the Southern borders of Tuscany. It’s the third thermal location in Europe for its water flow, the 42 thermal springs - whose curative properties are well known since Etruscan time - gush out at a temperature of 40 degrees. San Casciano is noteworthy for offering free natural thermal springs accessible to everyone: not far from the old center, there are some natural pools dating back to the Romans where you may enjoy the pleasure of a thermal bath! Surrounded by a gorgeous landscape - characterized by unspoilt nature and suggestive views - San Casciano is one of the most beautiful attractions of the area that actually deserve more than just a short tour. Some attractions you should not miss out: Fighine Castle, where you may admire all the surrounding valleys from, and Turrito Castle, looking on to the main square. Offering comfortable rooms with private bathroom and fully-equipped rooms, it is located near Sarteano in the Monte Cetona area on the border of Val d’Orcia. It has outdoor pool, tennis court and barbecue area. This relaxing country house is strategically located among the amazing Val d'Orcia area and the Umbria region. It has welcoming rooms, a nice swimming pool surrounded by a characteristic park of cypress. San Casciano marvellous spas - offering excellent and modern wellness treatments - are not the only reason you should visit this nice town in province of Siena: its old city center, with its architectural and artistic treasures and the particularly impressive urban shape, are really worth your while: San Casciano has been included in fact in the Borghi più belli d’Italia - The nicest villages in Italy - official list. The town has also gained the prestigious Bandiera Arancione - Orange Flag award for the excellent and quality welcoming offered to all tourists that choose this nice locality for spending their vacation. Besides the thermal resorts and the marvellous location - from the tiny streets in the old city center, you easily reach some places that offer breathtaking views on the surrounding countryside - San Casciano is situated close to many Tuscan popular attraction: Mount Amiata for nature and Winter sport lovers, Montalcino and Montepulciano for wine-and-food tours passionate, Bagni San Filippo for exploring other thermal destinations, and don’t forget you’re a few steps from Crete Senesi, Val d’Orcia and Valdichiana landscape, where you’ll admire those panoramas that have made Tuscany famous all around the world. Obviously, you can’t visit a Tuscan city without tasting its typical product! San Casciano in particular is renowned for its delicious recipes, that still preserve their Tuscan tradition with an originally modern touch. 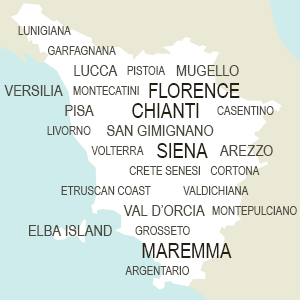 Included in the City of Oil, City of Wine and City of Chianina (the famous Italian breed of beef cattle, which the Bistecca alla Fiorentina is produced from) Associations aimed to promote and preserve these typical Tuscan products culture, San Casciano represents and hold the real essence of Tuscany.